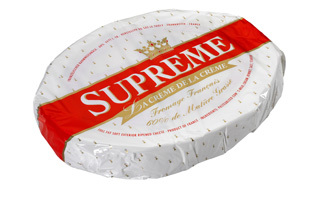 Made from cow's milk, Supreme is a soft ripened, bloomy white rind cheese enriched with crème fraîche. This heavy cream brie is known for being smooth, rich, and subtle at first, then slowly progressing into a more earthy and complex flavor profile. Inside the downy rind you'll discover a creamy center that boasts up to 70% butterfat. Born in the Burgundy Region of France in 1926, when François Paul-Renard, heir to the family cheese-making business, started a small cheese dairy in an old windmill. His father is forever credited with creating the production process that allows for a perfect maturing of packaged cheese. Later introduced in the 1930s under the name “Les Ducs” in Camembert size, by 1950 Supreme had gained a strong reputation.